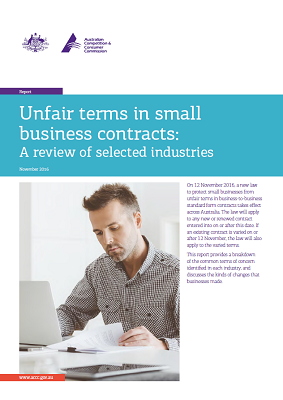 On 12 November 2016, a new law to protect small businesses from unfair terms in business-to-business standard form contracts takes effect across Australia. The law applies to any new or renewed contract entered into on or after this date. If an existing contract is varied on or after 12 November, the law also applies to the varied terms. This report provides a breakdown of the common terms of concern identified in selected industries, and discusses the kinds of changes that businesses made.